At the store customers will find an array of renowned Swiss Luxury watch brands including Carl F. Bucherer, Blancpain, Breitling, Cartier, Omega, Jaquet Droz, Longines, Rado, JLC and more. 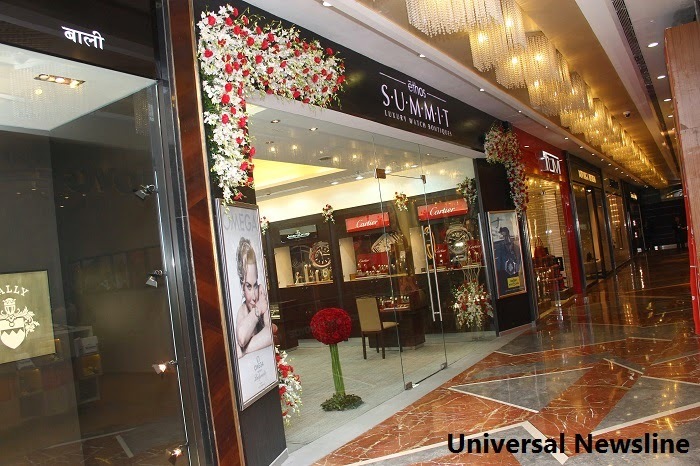 Destined to be the premier destination for Luxury Watches in Mumbai, the 887 sqft store is a one of its kind at Palladium, Mumbai and is the 7th Ethos Summit boutique in India. Ethos Watches, India's largest chain of luxury watch studios has 42 stores across 13 cities the country. Patrons can visit the new boutique between 10:00am to 8:30pm. Ethos Summit hosted a special private soiree in the store, giving select guests a first look at luxury timepieces. The boutique was inaugurated by His Excellency, Mr. Linus Von Castelmur, Swiss Ambassador in India along with Mr. Atul Ruia, Managing Director, Palladium Mall. It was a small yet exciting affair as the organisers had a treasure chest full of valuable gifts for their guests, guests were requested to bring along with them the key that they received with the invites. A lucky few won fabulous prizes including a coveted Omega watch. Mukul Agarwal, S. Nagarajan, Rajat Kakar, Prashant Agarwal, Dhananjay N Date, Michel Enderle, and many others were among the distinguished guests who were present at the evening. With a strong presence in travel retail, Ethos Ltd has stores across the domestic and international terminals of leading airports including New Delhi, Bangalore, Mumbai, Hyderabad and Ahmadabad. Ethos was founded with the vision to be the biggest and finest retailer of premium and luxury watches in India while incorporating exemplary ethical and customer service standards. Authorized retailers of over 65 luxury watch brands, Ethos prides itself in assisting customers choose the perfect watch for themselves or for their loved ones, while protecting them from rampant malpractices in India such as smuggled, fake and refurbished watches. Ethos Watches is India's largest chain of luxury watch boutiques, with 42 stores across 13 cities. Founded with the vision to be the biggest and finest retailer of premium and luxury watches in India, Ethos incorporates exemplary ethical and customer service standards. With a well-balanced and diverse portfolio of men’s and women’s timepieces, we are leaders in the Indian watch industry. Influenced by the world of luxury and culture, Ethos curates the best of the world’s iconic watch brands, including Rolex, Cartier, Omega, Breitling, IWC, TAG, Blancpain, Carl F. Bucherer, Longines, JLC and Rado, amongst others. Through our commitment to customer service, Ethos brings sophistication, style advice and knowledge to watch enthusiasts across India. Our stores are located at Mumbai, Bangalore, Chennai, Hyderabad, Delhi, Gurgaon, Chandigarh, Pune, Ahmadabad, Nagpur, Aurangabad, Bhopal, Surat and Ludhiana. Ethos also has a strong presence in travel retail, with airport stores at Delhi - International and Domestic, Bangalore – International, Mumbai – Domestic, Hyderabad – International and Domestic and Ahmadabad –Domestic. Launched in 2012,www.Ethoswatches.com is a niche, one-of-a-kind portal. With over 6000 spectacular watches on display - each meticulously segregated by filters including Brand, Price, Gender, Movement, Case Material, Strap Type and Water Resistance, to name a few, and over 50 luxury brands, watch enthusiasts are offered a varied collection to choose from. The website clocks over 360,000 visits and 1.8 million page views and over 12,000 calls received by the Luxury Watch Helpline every month. The unique watch concierge service is the country’s only ‘luxury watch helpline’, where customers can dial in and speak with exclusive ‘Luxury Watch Consultants’ for assistance in choosing a premium timepiece. For more details, visit ethoswatches.com.